Becoming more productive is about changing your habits. It's not something you do some of the time; it becomes part of the way you approach your work and get things done. Motivation is commonly thought of as fixed; you either have it or you don't. New research shows that we all have motivation inside of us, we just need to draw it out. We can improve it like a skill. We can build it like a muscle. Your drive is there. However strongly you feel it now, you can recruit it to be even stronger if you know what to do. Start by choosing your New Reality: your goals, future state, and the place you'll be when things change for the better. When you know your goals and connect them to your actions, those actions are much more meaningful. Plan your actions weekly to help get you there and have an accountability partner to help keep you on top of your commitments. Getting started on complex tasks is difficult. Once you start, it's much easier to keep going. Calendar your important activities and time. If you put it on your calendar, you're much more likely to do it. Count "3, 2, 1…Go" and just get started. You have a short amount of time to get started on something before your brain tells you it's too hard. Don't let it win. Use positive self-talk. Give yourself pep talks. When you feel positive, you're more likely to get started on important activities versus putting them off. You must do things differently (and do different things) if you want different results. If you want to do something—anything—differently, you need to understand your habits and know how to change them. Learn to affect each of the 4 elements and you can change any habit you want. Almost everyone at some point in their career toys with adopting some kind of time-management system. Few stick with it. The challenge is that many time-management systems focus too deeply on the activity level—what to do first, what to do next, what the priority order is—without paying enough attention to the bigger picture. The key to success and achieving top performance is maximizing your Investment time—the time you focus on becoming more effective, getting more done, and getting the right things done. This is the big picture. One way to do this is to focus on your Greatest Impact Activity (GIA). Your GIA is the one activity that, should you do it consistently at high quality, will get you the greatest eventual return on your time investment. We all have only 24 hours in each day. Where people tend to spend their time on any given day is a reflection of how they'll likely spend it for months and years to come. It's how you choose to spend your time and on what activities that most influences your results. You can't focus on your most important priorities if you say "yes" to everyone else's. You need to learn to say "no" to colleagues, employees, bosses, and even potential buyers if they aren't going to help you achieve your priorities. In order to reach your goals, you need to be brutal with your priority list. If you have 32 priorities, you have none. Ask a colleague or coach to help you be stern and say no to the lower priority priorities. There are always going to be mandatory parts of your job and life that you must attend to, but it’s up to you to control your TIME and where you spend it. Minimize or outsource the mandatory work and maximize the time you invest on your most important activities. This requires the ability to say no. Distractions are everywhere! In fact, people are distracted every 11 minutes. Distraction is an epidemic and it's getting worse. If you want to focus and become more productive, you need to free yourself from distractions. Do this by turning off all alerts, including email, phone, apps, social media, etc. Signal "do not disturb" by closing your door, turning on your out-of-office assistant, or wearing headphones. If you really want to play hard to get, go someplace where people can't find or disrupt you. You don't need to do these things all the time, but try implementing these strategies and gift yourself the space to focus, concentrate, and get done what you set out to accomplish. If you want to maximize effort per work hour, get in the zone. The zone (also known as flow) is a mental state where a person performing an activity is fully immersed in a feeling of energized focus, full involvement, and enjoyment in the process of the activity. To get in the zone, establish a daily routine of obsessed, planned Sprints. Sprinting is a form of timeboxing, a popular technique in many project-management and software-development methods. Timeboxing allocates a specific period of time (or time box) to a pre-planned activity. We recommend TIME Sprinting, which is 20 minutes (minimum) of obsessed focus on a planned activity. No stopping. No distractions. Obsessed focus. TIME Sprinting is one of the most powerful and effective strategies of the Extreme Productivity System (XPS). If you do it, you need to obsess over it just like you do when deciding how to spend your time. 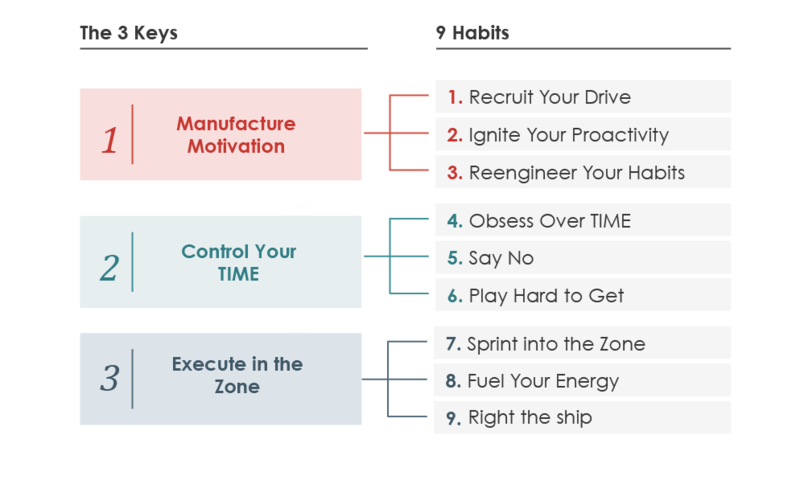 If you want to get more accomplished in the time you have, and you want to have that euphoric feeling of being extremely productive, you must execute in the zone. Doing these things fuels the stamina you need to achieve long-term extreme productivity. Changing habits and being productive isn't easy. We all fall off the wagon. The key is getting back on—and staying on—for longer periods. Earlier we shared how to ignite proactivity by saying "3, 2, 1…Go." The reverse also works to stop an undesired activity. Simply say, "3, 2, 1…Stop!" While conscious thought may or may not cause us to initiate certain behaviors, conscious thought can conclusively cause us to stop that behavior. If you're having a hard time making any of these changes in full, try making a micro-change. Cut it down and start there. Can't Sprint for 20 minutes? Try starting with 5. You can't finish in 5 minutes—everyone knows this—but most people don't stop when the timer goes off. Once you're into a particular task, you keep going because you're over the activation energy hump, and you're getting satisfaction and pleasure out of the progress you're making. There are many rich details and nuances to explore within each of these 9 habits. We didn't elaborate on every detail in this article. If you want to learn more, download our comprehensive (and complimentary) eBook, The 9 Habits of Extreme Productivity. At the end of the book there's a handy one-pager outlining the 3 Keys, 9 Habits, and specific productivity hacks you can begin applying today.